As Tet draws near, most peach trees are, thankfully, not blooming early - thanks to the cold. With more than 10 days to go to the Year of the Dog, ornamental wholesalers are rushing to peach-blossom gardens in Hanoi to choose their stock. Because the flowers have not opened in most gardens, prices this year are predicted to be slightly higher than last year (double or more at flower shops). Nguyen Canh Tan, a peach-tree gardener in Tay Ho district’s Phu Thuong village, said he had more than 150 peach blossom trees and peach blossom bonsai trees and half of them were booked already. Small trees are being sold at wholesale prices from VND400,000-600,000 ($17.7-26.6 ) per tree. Medium and large-sized trees cost about VND2-10 million ($88.8-444), Tan said. Vu Van Phai, a seller who has rented a stall on Tay Ho district’s Lac Long Quan street, said transporting a tree costs at least VND100,000-300,000 over a distance of 7-12km. Traders have booked most peach trees in Hanoi’s gardens, helping push up prices over last year. Sơn La in the northern mountains has also pre-sold much of its crop. Along both sides of National Highway 6, the section through Van Ho and Moc Chau districts, there are many places selling peach branches taken from trees in the wild. Peach blossom sellers said that they had pre-sold most local trees and were now importing from Laos. Each forest tree costs from hundreds of thousands of VND to more than VND10 million. Big trees with good shapes and covered in moss are more expensive. Lo A Nha, a resident from Van Ho commune, said peach blossoms this year were more beautiful than last year. Each year, he earns about VND15-20 million from selling peach trees for Tet. Forest peach trees have become popular in cities and provinces during New Year, so many ancient peaches in H’mong ethnic regions have been cut for sale. Lai Van Thang, a resident in Hanoi, said he often went on business in northern mountain provinces at the end of the year and bought a forest blossom branch to decorate his home. A Hanoian living in Thuong Tin district, Bui Van Dung, said in recent years, he often went to Sơn La Province to buy famous peach blossom trees named that thon for sale. These trees are not too high, have rough, exposed roots and plenty of mould. Flowers could grow from the middle of the root and the trunk and cost from VND5-30 million per tree, Dung said. 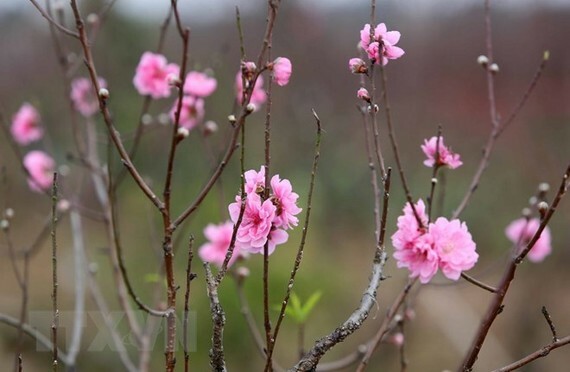 Many growers in central Thanh Hoa province’s Xuan Du commune, a well-known peach blossom commune in Nhu Thanh district, are upset because peach flowers there have bloomed earlier than expected, meaning slightly lower prices. Seventy percent of the trees in the commune are in full bloom. Last year, 80 percent of trees in his garden were booked ahead of Tet, but this year most traders looked at the garden and shook their heads, he said.